Aid conditionality appears to be a subject of recent controversy—not all conditionalities are controversial though. Some—as pointed out by the writer in these columns on October 22—particularly those related to governance reform may be useful for a country, if the structural changes stipulated are carefully implemented. However, in doing so the country must have the capacity to analyze how the generic approaches embodied within aid instruments can be germane to strengthening a specific aspect of governance or management within a country context. This comment focuses on one of International Monetary Fund’s several recent conditionalities to highlight how that can be the case. In its recent set of conditionalities, the International Monetary Fund has stipulated that the government abolishes 13 ministries with a view to reducing unnecessary establishment expenditures. The suggested approach can be important within the context of the current fiscal space constraints in view of the country’s prevailing macroeconomic situation and the need to rationalize costs, better integrate programs, and reduce duplication within that milieu. In addition, it is also additionally relevant to the ongoing negotiations on the National Finance Commission (NFC) Award and the deliberations currently underway, with regard to constitutional amendments and the fate of the Concurrent List. In relation to the NFC award, provincial concerns about the federal government taking a large pie of the federal divisible pool and calls on their part to adopt measures to reduce the cost of running the civil bureaucracy in Islamabad is one reason why merger of ministries should be considered as an option. Ideally, this should be part of a larger drive towards greater provincial autonomy, scale down/abolition of the concurrent list—an outcome, which the Parliamentary Committee on Constitutional Reform should be headed towards. But even if that were to happen, merger of ministries and duplicating structures—theoretically, an evidence-based approach—would be an extremely difficult measure to implement, because of turf issues and jurisdictional, structural and other human resource-related considerations. Some of these issues may be unique to each one of the 13 ministries, where merger is proposed. Merger of the Ministry of Population Welfare with the Ministry of Health would, in fact, present the highest level of complexity for a number of reasons, which are briefly alluded to here to highlight the magnitude of the envisaged challenges. Prima facie, it appears logical to merge the federal and provincial structures of the health and population sectors. Both have ministries at the federal level and provincial departments; both have similar administrative units and service outlets in the field and mobile service units. However, despite this similarity, functioning of both the sectors is quite different. Both the sectors have different sources of funding and different channels of fund flows and controls. The population sector is financed entirely through federal funds from the Ministry of Population Welfare down to its service outlets in the districts. Flow of funds takes place through special channels different from the normal channels of the provinces and districts. Health, on the other hand, is funded by federal funds at the federal level, by provincial funds at the provincial level and by allocated provincial funds at the district level; local funds are also allocated at the district level. Unlike population, resource allocations in health at the provincial and district levels are independent of directives from the Ministry of Health. The funding mechanisms for health and population, therefore, follow separate channels with different arrangements. Hierarchical relationships within each sector are also different—population is federally funded, is not devolved and is only partially de-federalized, whereas health is both federally and provincially funded and stands decentralized. As a result, there is hierarchical continuity in population—from the Ministry of Population Welfare to Population Welfare Departments to districts in planning, programme formulation and implementation and monitoring. In the health sector, there is no such continuity. The departments of health make their own programmes without directions from the Ministry of Health, and similarly, the district governments are free to determine their own priorities without any reference to provincial priorities even if they exist. Both these complicated standalone arrangements can be an impediment to any efforts aimed at institutional merger. A historical review of efforts aimed at merger and functional integration also indicate reluctance on part of both population as well as health. Merger poses a threat to the careers of staff in the Ministry of Population Welfare, who are likely to resist if status quo is challenged. On the other hand, reluctance on part of provincial health departments is also evident. Despite several high-level directives over the last three decades, significant progress has not been achieved. These directives include the Executive Committee of the National Economic Council’s (ECNEC) decision of 1985, the Federal Cabinet decision of 1991, the Chief Executive Review Committee’s recommendations of 2001, and the decision of 2006 by the National Commission for Population Welfare, which was presided over by the then Prime Minister. In addition to lack of will at the administrative level, there also appears limited political will to go ahead with mergers, as this would eliminate an additional slot for a minister—something political governments vie to create in order to oblige functionaries. Constitutional stipulations pose additional difficulties. Health is a provincial subject whereas population is in the Concurrent List. As a result of all these considerations, merger can be fraught with many impediments. Lessons from other developing countries can be instructive in assessing the impact of institutional impediments on any attempt that aims to merge institutional structures. The example of Bangladesh is particularly relevant for Pakistan, given the institutional similarities. Bangladesh experienced difficulties in merging its health and population departments even though it had more favourable conditions compared to Pakistan—unitary form of government and therefore no provincial level, continuous and identical hierarchical structures, same funding sources and similar channels of fund flows and no difference between the two hierarchies with respect to the degree of decentralization. This experience can provide useful insights into the dynamics of institutional integration vis-à-vis the countervailing forces and their determinants. Despite these challenges, it must be recognized that merger is not just a valid approach from a fiscal and efficiency standpoint it is also a technical imperative. Health and population have shared agendas, which calls for integrating family planning with healthcare. As both the sectors need to be reformed in their own right given their abysmal operational performance, it makes sense to merge both the institutional hierarchies in any new arrangement. A recent policy analysis on the subject published in a special supplement of the Journal of Pakistan Medical Association has called for reconstituting service delivery arrangements, where family planning and reproductive health can be grouped together in the package of essential health services. The latter needs to be benchmarked as a yardstick for public delivery and as the basis of contractual relationships in new management restructuring arrangements. The analysis notes that although merger is not the only solution to the multifaceted issues faced by the health and population sectors—both being influenced by the social and economic determinants and overall performance of state service delivery systems—it is nevertheless necessary if not a sufficient step. Examples of successful institutional mergers in the corporate sector reaffirm the notion that if the right incentives can be created for human resource, institutional mergers can actually be achieved. The above-mentioned case demonstrates the complexity involved in institutional mergers. These complexities also hold true for any structural decision. The ultimate success of structural changes rests on the capacity of a country to analyze the imperatives, the envisaged impact and possible fall-out of decisions and its commitment to deploy knowledge-based solutions. We must enhance our capacity in these areas. The recent discussions regarding the Kerry Lugar Bill and the debate about the value of aid in general on its sidelines, brings to the fore the understanding that both sides—donors as well as Pakistan—have very high expectations of aid in terms of what it can deliver and catalyze. Before setting such high hopes, it is critical that we impartially analyze the past impact of aid on various outcomes in Pakistan. Whilst doing so, it is important that we move beyond polarized and politicized discussions on the subject; balance sensitivities with pragmatism; get a common understanding of the evidence that can guide future action; and carefully plan so that the interest of Pakistan as well as the global community can converge. Before flagging the analytical dilemmas, a key prerequisite is to get the bearings right. The aid ‘industry’ is complicated. A number of actors—multilateral and bilateral development agencies, the United Nations system, global health initiatives, and private foundations are part of its landscape. Aid is delivered as grants, concessional loans, debt swaps, and bail out packages through various instruments under different policy and contractual norms. In Pakistan, it is a conglomeration of humanitarian assistance; military assistance, in-kind aid, particularly in the case of food aid; budget support; and Official Development Assistance—the commonly used measure of development aid. In case of the government, support is on-budget and off budget and on-Public Sector Development Program (PSDP) and off-PSDP. There are projects of various cycles with information relevant to allocation, disbursement and expenditure, which need to be taken into account. Before analyzing impact, it is important to ascertain if information is in order to allow analysis. The Donor Assistance Database of the Economic Affairs Division needs to be reviewed in this regard and other sources of information identified to allow triangulations. Many questions emerge with regard to the actual impact of aid. The first is overarching in nature. Pakistan’s history of aid is closely related to its role as an ally in international politics during the ‘three decades’ of surges in international aid—1960s, 1980s and 2001 onwards—during which donors envisaged support to lead to a set of outcomes. Outcomes, of course, mean very different things depending on which side of the fence you are on. Pakistan was successful in enabling the donors to meet their foreign policy objectives in these decades. But how strongly did the decision makers of the time think of how to exercise leverage on the support provided to Pakistan to strengthen process of the state and bring welfare to its people. Did the conflicting polices pursued in concert with the latter two ‘cycles of support’ inadvertently pave the way for the current conflict. We must delve into these determinants, and learn lessons. The purpose is certainly not to discredit aid during these years, as aid also brought significant value, but to use strategic insights to shape policy. Secondly, the impact of aid on macro-economic outcomes needs to be ascertained. Aid has led to growth in the ‘three decades’, but growth couldn’t be sustained. Expert economists can help ascertain why that was the case and determine the impact of aid on other macroeconomic outcome-related parameters. Was aid able to bring about improvements in productive assets and did it go preferentially into projects that could generate resources necessary to pay back loans? To what extent did aid build national capacity to mobilize domestic savings and raise domestic revenue? Is there any correlation between aid and domestic savings and between aid and the tax-GDP ratio? Were grants ever used to repay debts? What exactly has the impact of grants been on contributing to dependency? And how predictable has aid been? The government should conduct and consolidate an empirical analysis in order to draw on objective insights, which should then be used to shape policy. In the third place, the potential within aid vis-à-vis other resource mobilization options needs to be objectively ascertained. Aid is perceived today as the option of choice, despite the understanding that widening the tax net is a more sustainable option. It is generally stated that the latter cannot be achieved because of state capture by the elite, in particular feudal landlords and interest groups, which are currently outside of the tax net. It needs to be ascertained if that is the case and if the links created through political patronage can further such collusive behavior. The institutional capacity constraints at the level of governance, which limit the ability of the government to access financial markets and/or mobilize funds through innovative means are also particularly important in this regard and need to be determined. It takes a lot more than aid to improve macroeconomic and development outcomes—a consideration the writer has recently alluded to in these columns on September 28. In the same comment, the potential within external resource transfers/support other than aid has also been underscored—in particular with reference to debt relief, foreign remittances, terms of trade and intellectual property. In the fourth place, the impact of aid on social outcomes must be assessed. Was there any increase in aggregate allocations for the social sectors during the ‘three cycles;’ did utilization improve; was there any impact of aid on plugging pilferages and leakages from the system? What has the effect of aid been on outcome indicators? Can improvements be attributed to the inflow of aid? And if that has not been the case, were the central systemic issues that impeded the impact of aid on outcomes, included as targets in subsequent rounds of aid indicators? Donors have invested in a number of projects over the years. Were these grounded in practical pragmatic realities? What percentage of them could be up-scaled and how many had a knock on effect on broader systems restructuring. Was there any accountability of public functionaries for not taking recommendations of technical assistance reports—many of which were funded through loans—to fruition? These areas are difficult areas of policy research, but are nevertheless very important to get a sense of before renewing the expectations of what aid can achieve. In the fifth place, assessing the impact of conditionality on performance and ownership becomes critical, particularly in view of the recent divide of opinion over the Kerry Lugar conditionalities. Pakistan has complied with a number of aid-related conditionalities in the past. IMF’s stipulations in order to overcome external payment problems, structural adjustments, privatization of state enterprise, changes in policy norms and legislative arrangements are all examples of conditionalities that Pakistan has complied with in the past. The impact of these conditionalities should be assessed. The Paris Declaration on aid effectiveness indicates that conditionalities can undermine country ownership—in case of the Kerry Lugar Bill that does appear to be the case. However, on the other hand some conditionalities, particularly those that relate to transparency building reform of governance can be useful in the long term if the fundamental structural reforms stipulated as part of these polices are faithfully implemented. Lastly, we must explore if there were any negative inadvertent consequences of aid. Is there evidence of aid having crowded out the space for domestic investments, particularly in the social sectors? And if that was the case, was it due to issues with utilization or the fear of long term unpredictability of aid. Evidence from some countries demonstrate that governments might use international aid to keep their foreign exchange reserves stable and spend the local currency counterpart with resulting macroeconomic problems, such as inflation. The potential impact of this phenomenon in today’s complex environment must be taken into account. Aid can be an important catalyst. However, its impact is directly related to the robustness of the local system of governance. Evidence-guided planning is needed for addressing the challenges in making aid effective. In order for that to happen we must seek answers to these questions. 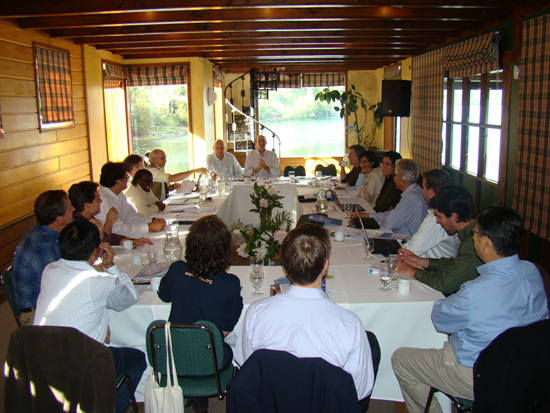 October 21, 2009: Sania Nishtar attends planning meeting of the First Global Symposium on Health Systems Research, as a member of Scientific Advisory Committee in Puyuhuapy, Chile, from October 19–21, 2009. October 14, 2009: Sania Nishtar attends meeting of the Alliance for Health Policy and Systems Research as a member of the Board in Geneva, Switzerland, on October 13-14, 2009. The comment is a review of Pakistan’s legislative framework regarding freedom of information. It underscores the importance of updating Pakistan’s existing 2002 FoI Ordinance in order to improve access to information and disclosure, which can enable public discourse in larger national interest on issues of governance. A number of civil society organisations have drawn attention to the need for strengthening Pakistan’s existing Freedom of Information (FOI) legislative framework on September 28 —the Right to Know Day. FOI is not to be confused with media freedom. FOI is an important component of the international guarantee of freedom of expression, which includes the right to seek and receive as well as impart information and ideas. It has to do with access to information and disclosure, which can enable public discourse in larger national interest on issues of governance. FOI has been described as the ‘oxygen of democracy’ by Article 19, the Global Campaign for Free Expression. Within this context, this comment is aimed at exploring the current instruments and the approaches that can be adopted to strengthen the FOI-related normative framework in the country. The issue has assumed importance in Pakistan for a number of reasons. First, the opportunity to review constitutional covenants with respect to the said subject must not be missed in view of the on-going debate on constitutional amendments. Secondly, there appears to be a renewed interest in Pakistan’s existing Freedom of Information Ordinance, 2002, which despite its weaknesses is still in force. In fact, the incumbent government had signaled its intent to repeal the law and re-enact legislation in this area on assuming office a year ago. The third imperative stems from the openness of the electronic media and heightened interest of the literate population of Pakistan in current affairs, and the recent burgeoning of disclosures – the motivation behind some of which are a point of great debate today. Lastly, the access to information clauses in the Kerry-Lugar Bill also create an imperative for the government to strengthen its own normative framework. The Constitution of Pakistan does not refer to the right to seek and receive information as elements of freedom of expression. Article 19 states that “every citizen will have the right to freedom of speech and expression”. Freedom of information is not explicitly included in the guarantee of freedom of expression, which includes the right to seek and receive as well as to impart information and ideas. Pakistan has also neither signed nor ratified the United Nations’ International Covenant on Civil and Political Rights. However, despite this lack of clarity, the Supreme Court in a 1993 ruling stipulated that the right to freedom of expression includes the right to receive information. Here, it must also be noted that the Universal Declaration of Human Rights (UDHR), in its Article 19, which guarantees the right to information — though not binding on states — is widely recognised as having acquired legal force in customary international law, since its adoption in 1948. The current constitutional amendments, therefore, need to clarify if FOI is an explicit civil right in Pakistan. It must also be noted that it is purely coincidental that Article 19 of Pakistan’s Constitution and Article 19 of the UDHR focus on the same subject. Article 19 is also incidentally the name of the Global Campaign for Free Expression, an international NGO which conducted an in-depth analysis of the 2002 Ordinance, as has been described later in this comment. Pakistan was the first country in South Asia to promulgate a FOI law. Two laws have been promulgated, to date — both as presidential ordinances. The FOI in 1997 lapsed, as it could not be re-promulgated whereas the 2002 Ordinance, which was promulgated to comply with an Asian Development Bank conditionality, acquired permanent status after the 17th Amendment. This federal statute was followed by similar legislation in Sindh and Balochistan. Article 19, the Global Campaign for Free Expression, issued a memorandum to articulate its views over the 2002 Ordinance the same year. A number of positive features of the ordinance were highlighted. Among these were “inclusion of the interpretation clause, the right to appeal to the ombudsman, a clear time frame for release of information and the inclusion of courts and tribunals in the definition of public office.” The memorandum also alluded to many weaknesses of the 2002 ordinance. In particular, the excessive broad regime of exceptions and the restrictive approach to the definition of public record. Several sections of the 2002 ordinance in particular exclude many categories of public documentation from the purview of this law. The lists of exemptions in the 2002 Ordinance are broad and seem to implicitly extend to information that is proprietary, intellectual property right or trade secret-related; information of a personal nature; personal health and employment-related information, and information relating to procurement processes that involves pre-qualification information. The list also includes classified information where disclosure would undermine protection of public interest as regards public security, defense, and military matters; international relations; and financial, monetary, or economic policy. These exceptions when truly exercised are justified. The issue relates to the exemption list in the area of information that is termed ‘privileged internal’ or ‘other information’. As part of this many internal notes, memoranda, and deliberations on state policies and laws are precluded from being in the public domain. Deliberations of the ECC or the cabinet, for example, are not in the public domain and when they are declassified, the time window to make meaningful use of the information is already lost. Even if these concerns are addressed, the utility of any FOI law remains questionable in Pakistan since many laws can still be invoked at any time to override the statute. Various sections of the penal code and a number of laws of contempt, official secrets, and censorship are notable in this regard and make the existing FOI statute, in effect, toothless. It needs to be explored if protection and immunities can be built into the new iteration of the FOI law to guard against this. As the law has to operate in the broader context of governance, review of transparency promoting laws, particularly in the area of whistle blower protection, and accountability assume importance, as these can be supportive to promoting a culture of freedom of information. The analysis presented in the memorandum also brings to attention the absence of a provision to strengthen the public’s right to know and the lack of a clear obligation on training authorities to train public sector functionaries in this regard. The most important aspect of developing and implementing an FOI legislative framework is to change the institutional culture within government agencies and the civil society. Governments inherently mistrust the civil society and perceive FOI as a tool that meddlesome NGOs and individuals use for harassing public functionaries. Some NGO and individuals, on the other hand, also have very complex motives and tend to abuse the ‘right to know’ prerogative. On the other hand, public functionaries often unduly guard information that can be put to constructive analysis by impartial civil society actors, benefiting the government in turn. The government needs to fully appreciate that the public has a legitimate interest in being kept informed in a democratic society. The civil society must also be cognizant of the fact that governments have a legitimate interest in withholding information in certain circumstances. In order to fully realise the potential within FOI as an essential underpinning of participatory democracy, good governance and accountability, both sides must exercise this right with great prudence and responsibility. However, it must be recognised that FOI is not an end in itself, but a means of improving governance. In that respect, it is just part of a holistic approach that needs to be fully institutionalised.